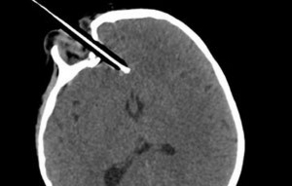 A toddler in the UK fell onto a pencil and had it lodged in her brain through the eye socket. Fortunately the eye was not damaged and the pencil was removed in a four hour operation. Forget running with scissors, this is a pencil! I know the pen is mightier than the sword but I think in this case, the child is very lucky to not be dead or permanently disabled. The child’s mother is a nursery nurse and knew enough to not try and remove the pencil. I can only begin to imagine her distress and the distress of the child. Keeping the kid from grabbing at the pencil would have been a job and a half. I have five girls, including one who is 2 and I know how we felt when she caught her toe in the treadmill and lost some skin. I have also been dead and brought back to life by the skill of a surgical team made up of dedicated professionals like the one that saved this little girl’s life. Those people don’t accept almost, nearly or close enough. They go for 100% each and every time they scrub up. If anyone deserves to make $75 million dollars a year like Tom Cruise allegedly did in 2011, it is people like these and not actors and artists,no matter how talented. Definitely not politicians and certainly not people who inherit their wealth through the exploitation of the resources and mineral wealth that belongs to the nation. Let’s keep things in perspective, people. Next time you watch some asinine un-reality show, think of the people who are really talented, really dedicated and really making a difference to the quality of all our lives. We can’t all be surgeons and theatre nurses, ambulance officers and even hospital catering and cleaners as all play a vital part. But we can be aware that losing weight, fixing up old houses, dancing singing, cooking and behaving badly on camera are not the pinnacles of human achievement. Go home, hug your kids, hope they never need brain surgery and try and keep them away from the glass toilet in the lounge room. Remember, just because they call it ‘free-to-air’ doesn’t mean it is worth airing.